Hats off to director Ilan Ziv for attempting the difficult, perhaps thankless, task of creating a film history of capitalism and to Icarus Films for distributing both of these movies. In the accompanying notes to Icarus Films’ 3-disc DVD set of this 6-part TV series, Ziv says that the history of economics is no longer taught as part of the general economics curriculum... an astounding thing to say. Yet since watching the series I’ve read the same thing elsewhere and have also heard it said from a one-time econ student. Ziv also confesses to having known little to nothing about economics at the beginning of the project but came out of the process “having read more than 100 books” traveled to 20 countries and interviewed “... some of the world’s leading economists.” His self-taught knowledge of the history of that dismal science may well be better than many who are degreed in economics. Further in his notes, Ziv says that the most important thing he learned in making the series is that economics is not “a science that can be studied and understood.” That to me is also an amazing thing to say, yet Ziv does not dwell on this point in the series. Instead, he gives us a straightforward, if heterodox, history of capitalism. That alternate-history aspect to Ziv’s effort is for me the most interesting and useful part of the series and probably the reason why I had not heard of it and why it is not likely to be aired in the USA. Capitalism is truly “politically incorrect” in that it’s not the “correct” corporatist version with which Americans are more familiar. Ziv’s version of the history of capitalism begins traditionally enough in 1776 with the Scotsman Adam Smith and his attempt to create a science of economics. 1776 is when Smith published his book An Inquiry into the Nature and Causes of the Wealth of Nations. Ziv credits Smith with inventing economics as a science but not capitalism as a practice. Ziv then shows us that capitalism is a thing that had been evolving in Europe for centuries before Adam Smith’s time. Drawing an imaginary line in time’s sand, Ziv cites 1492 and the Europeans’ discovery of the New World as the real birth of capitalism. Adam Smith then described and formalized the little-C capitalism of his time. And we are shown that capitalism grew out of some pretty shady activities... slavery, violent conquest and continent-wide thievery. And most importantly, a new concept of debt. Debt it seems is a cornerstone of capitalism. Here Ziv subtly begins laying groundwork for a larger theme in the series. It is a theme of a society-wide sea-change bigger than just a new way of trading. Capitalism (the series) is full of insights and revelations such as the clever comparison of Smith with his predecessor Sir Issac Newton. Smith wanted to become the “Newton of Economics” by rationally describing the physics of that human activity which Smith called “truck, barter and exchange.” It seemed like a good idea at the time. The biggest revelation to me about Adam Smith was the fact that his phrase “invisible hand of the market” appears only once in Wealth of Nations and when it does, its meaning is not as it is understood today. It was at this point that Ziv got my full attention. If you have ever heard of Adam Smith, chances are good that you’ve also heard about the “invisible hand.” Generally that “invisible hand” is understood today to mean that the market sets the price of a thing and the consumer is guided, as if by an invisible hand, to the lowest price. In reality Smith said that capitalists will prefer to put their money back into their own country, guided as if by an invisible hand... a profoundly different meaning. Over the course of the next 5 episodes, Ziv continues his historical narrative with lively sketches of the main players... men like Malthus, Ricardo, Marx, Keynes, and Hayek and I leave it to Ziv to describe them. These economists are people who have had a profound effect on your life yet, apart from Marx, are possibly men you have never heard of. Along the way Ziv continues to build a case for capitalism and its free-market-centered life as an environment that is, if not entirely unnatural, unlike anything humans were evolved to live within. This is a different thing than Marx’s relationship to capitalism. Everyone seems to agree that Marx had done a brilliant analysis of the kind of capitalism he saw around him in 19th Century Europe. It was Marx’s class struggle corrective to capitalism that rocked the 20th century with revolution and war. By 1991 and the end of the Soviet Union, Marxism was out and there was no serious alternative to a philosophy of unrestrained free-market capitalism. Yet as is obvious, that triumph of the free-market is unsustainable if not outright destructive to the planet and humanity. In the final episode, Ziv introduces one more historian and economist: Karl Polanyi. I’ve at least heard of all the other historical figures in this history, but Polanyi was a new one to me. Polanyi’s 1944 book The Great Transformation sounded so intriguing I checked out a copy from the library and read it. Imagine my surprise when I realized that The Great Transformation is pretty much an outline for the Capitalism series. Ziv is standing on the shoulders of an unknown giant. The economic philosophy of a unfettered free-market has turned human society and the world on its head and I think a corrective for the damage done will not be accomplished in one lifetime. But a better understanding of the problem is doable now and Capitalism, Ziv’s retelling of Polanyi’s thesis, is a great first step to that understanding. Read the book, see the movie! If Ilan Ziv’s Capitalism uses an emotionally charged title, director Jason Barker ramped up the game with his Marx Reloaded. The Cold War may be thirty years gone but Karl Marx’s name can still gather a crowd... both for and against. Ziv told us he came to his project without any knowledge of economics and presumably without bias (though we could maybe guess.) Not so with Barker who must have had at least a receptive ear to Marx’s thinking. My suspicion is that the title and original conceit that Marxism can lay bare a hidden reality a la The Matrix franchise was the spark that drove Barker’s project. Marx Reloaded was made shortly after the world financial crash of 2008. The “Reloaded” part of the title serves double duty because Baker’s film is also about Marxism rising phoenix-like at the first sign of capitalism’s 2008 demise. 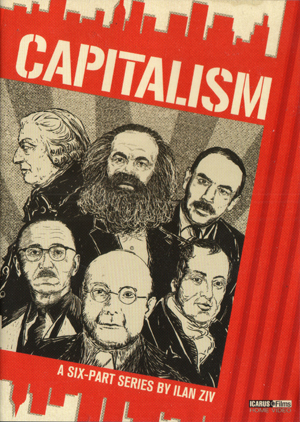 However by the time we reach the end of the film, there is no clear-cut alternative to capitalism, including Marxism. Baker seems to still be looking for a solution to what he sees as the evils of capitalism. The historian Tony Judt wrote in his 2005 book Postwar, that despite all that has happened in Europe (and the world) in the 20th Century, the basic argument between capitalism and Marxism has not been settled. I feel like something of the same has happened here. If Polayni was right, Marxism is as much a creation of the market as is capitalism. In that light. Marxism is not a solution but is part of the problemÖ a problem that can not be solved by Marxism squaring off with capitalism. Both Marx Reloaded and Capitalism follow roughly the same trajectory in terms of finding fault with capitalism. For whatever reason Ziv knew about Polayni (I suspect better scholarship by Ziv) and Baker either did not know about The Great Transformation or did know and rejected Polanyi’s thesis because it was not based on classic Marxist class struggle. I favor Baker being unaware of Transformation. Marx Reloaded was made in 2010 and Capitalism in 2014. The most recent edition of Transformation was published in 2001. It could easily have taken more than 10 years for Transformation to break free of academia and get into the general population. After all The Great Transformation went without a wide audience for 70+ years and may be only now gaining some traction. So I see Marx Reloaded as more of an artifact than an instructive film. 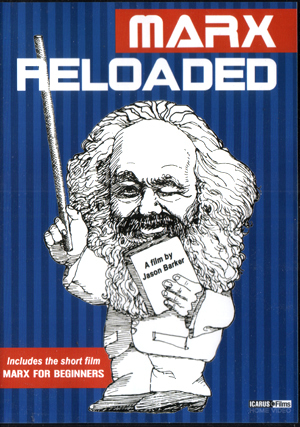 Indeed Marx Reloaded comes with the added feature of a 1978, 7-minute School House Rock-like animated short, Marx for Beginners that doubles down on the historical artifact aspect and is worth viewing if only for the brief cameo rip-off of R. Crumb’s Mr. Natural. Even by the standard of 1978, that would have been an anachronism. In contrast, Capitalism the Six Part Series, though also a bit dated (as is everything before the 2016 election) is well worth the trouble, I’m sorry I did not get to see it sooner.